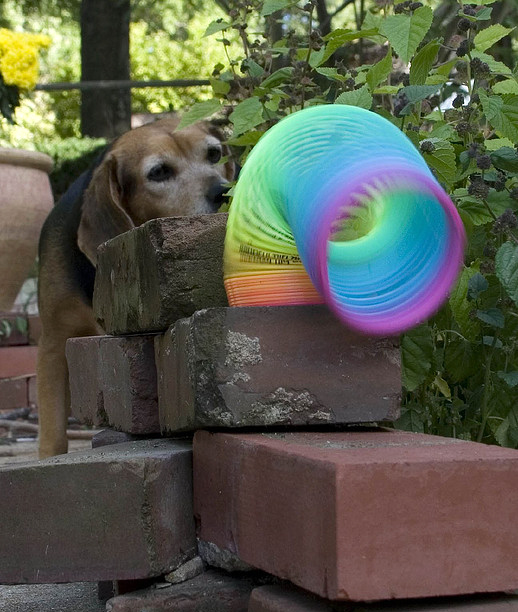 "Missy and the Slinky" by Dave Clark on Flickr (noncommercial use permitted with attribution / no derivative works). The U.S. Postal Service issued a Slinky postage stamp in 1999. The Slinky was inducted into the National Toy Hall of Fame in 2000, and also appears on the Toy Industry Association's 2003 "Century of Toys List" (the 20th century's top 100 most memorable and creative toys). In 1943 three men in Philadelphia (Richard James, Coleman Barber, and Dylan Gedig) observed a torsion spring fall off a table and roll around on the deck at the Cramp shipyards in Philadelphia. Thinking there could be a toy in this, the three men borrowed $500, experimented with materials, ran tests, and produced 400 units of the toy. Richard’s wife Betty James came up with the name "Slinky." In 1945 Richard and Betty James were granted permission to set up an inclined plane in the toy department at Gimbels in Philadelphia to demonstrate the slinky’s battery-less "walking" abilities. In 1948 they built a factory in suburban Philadelphia for James Industries' 20 employees and ten years later headquarters were set up in Hollidaysburg PA, where the factory remained for thirty years. 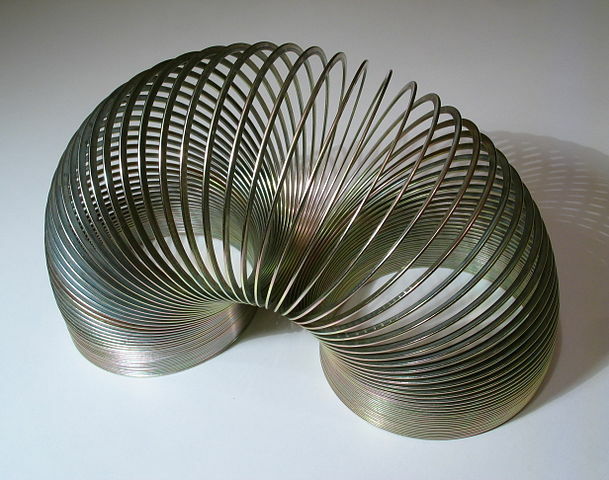 Classic slinky toy; photo by Roger McLassus on Wikipedia (use permitted with attribution / share alike).